So much for staying off the scale for a month! I shoulda known I'd never make it. So a few days ago I noticed that my ankles looked less like a continuation of my calf and a bit like ankles again. That got me to thinking maybe I've lost some of this water weight. That got me to thinking about the scale and next thing ya know...181.2 and 38.5% body fat. So, with a pre-pregnancy weight of 164.8 and a current weight of 181.2 that puts me at -16.4 pounds from my "official" pre-pregnancy weight, and 22.4 pounds from my low of 158.8 pounds. I'll take it! So the next question is when should I return to Weight Watchers? My plan is to start to meetings and learn the new Momentum program but not put any pressure on myself to actually follow the plan. I'm just going to go to meetings and see what develops naturally. Maybe I won't start following the plan for a few weeks, maybe I'll be inspired and start right away, maybe I'll make incremental changes and sort of slowly start following the plan. I don't know, but I know the only expectation I want in the beginning is to go to meetings. This method worked really well for me when I initially started WW back in February '07. Wow, it's been over two years since I started WW. I looked up the meetings and my old meeting is gone :( The only one at that location is a 9:30am weekday meeting. 9:30am?! Hmph. Not gonna happen. The only other evening meeting nearby is at a location where the meetings are big. I don't like big meetings, too impersonal. But I guess if I have to choose between 9:30am and big/impersonal it'll be big/impersonal. I'm going to the doctor on Friday for my postpartum checkup. I suppose this is a good place to get an opinion as to when to start back. The docs there are of varying fitness levels, and this is just based purely on my observing body size, which I know is wrong. On Friday I'm seeing the super-skinny one who wears chic clothing and high heels. I'm guessing she'll tell me to start back right away :) Assumptions are fun aren't they? Well, looking back over my pregnancy weight gain I am pleased with how things went. In a lot of ways I could have done better, mostly with maintaining a better activity level. The exercise quickly became nearly non-existant. The food was hit and miss. I went through phases with the eating, sometimes out of control, sometimes not. After a while the novelty of eating sort of wore off and in the last trimester I didn't gain as much. I am more enthusiastic about getting back into shape now that I have a little guy to keep up with. I want to be able to have fun with him and go on adventures and not be held back by being out of shape. I want a hike to be fun and easy, not a challenge. Anyway, he's inspiring me. Well, it's taken me three days to complete this post. Welcome to my new life I guess, eh? I'll close with a new pic of my little guy :) How sweet is he??! It's a shame your old meeting has gone - hopefully you can work something out. Roni from Ronisweigh.com started WW with baby in tow TWO weeks after birth. In the old plan, they had extra points for nursing moms...so I say do it when you are comfortable. As in pregnancy...he will take what he needs from you when nursing. Just make sure you are continuing to make milk...BTW, he is SO cute! 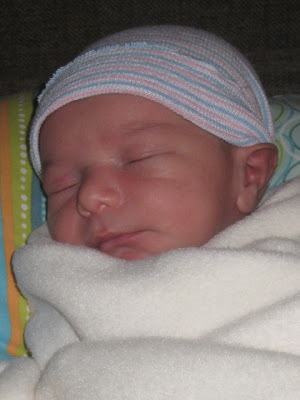 I can't wait to come meet Marek....he is so perfect! The standard doctor workout rule is usually at 6 weeks post partum, and that's with just about any doctor, however, as you've said, it depends on the doctor and how you feel, since you've had a c-section. I'd be willing to say you still will drop more weight 'instantly'- I would not even yet consider this as your 'starting weight'. It really does take 4 - 6 weeks for all the fluids, hormones, blood volume etc to settle down. So you may find you only have about 15 pounds to lose! Congrats again and keep the pics coming! not bad at all! I think you did really well, and I know youll have no trouble getting the rest off. just find something that works for you and your life right now. I think you'll be pleasantly surprised at how your body is transformed by constantly lifting the little one. Your arms will be so toned, and the extra weight will shed in due time. you know I love you Michelle, but I can't help it...every time you post a pic of Marek I can't think of anything else. He is so beautiful it makes me cry. you have so very little weight to lose..it really will come off. all you have to do is eat healthily, go on some walks, play with marek in some lifting ways when you can, and you will be amazed how fast you are back where you were, you athletic studess, you. Congratulations on your little guy. He's so perfect. He is adorable, of course! And I think you did great with your weight! Good luck getting back with it. CONGRATULATIONS on the arrival of your son! I've been out of the blog loop for a bit and am catching up. Your son is beautful ! Relax a little about yourself. There is plenty of time to get it all back together. congratulations on your little man! Hope you all are doing well! Oooh soo cute!!!!! 1. He is too precious! 2. Wowsa you are already doing so so amazing!!! 3. So did you sign up? How is the new meeting/plan if you did?